A good series gets better. At the ripe old age of 51, sequestered in Constantinople and condemned to die, Ezio Auditore da Firenze is ready to retire. Having been an assassin for 30 years, he is unclear about his future. He has questions. Doubts. This journey is his quest to answer these questions, to justify or condemn his actions. This will be our last adventure with him. 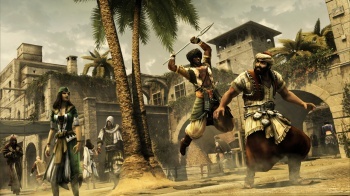 In his attempt to flee 17th century Constantinople, Ezio seeks help from the elegantly costumed Ottoman assassins, to fight for and with him. This is his final hurrah. We are reaching the end of our journey with Ezio and Altaire, but from the looks of things, they're going out with a bang. I mean that literally. Revelations is exploring their love for explosives. The range of explosives are a'plenty in this iteration, expanding your arsenal by allowing you to rig your own explosives, for both offensive and defensive purposes. Smoke bombs will hide you from pursuers until you escape, or sneak within the smoke, using your eagle sense to see your enemies, and to dispatch them. Splinter bombs...well, they'll kill everybody. My favorite new item was the Hookblade, which is exactly what it sounds like. A hooked blade allows you to climb buildings quickly, and zip line from one building to the next using available ropes. If at any point there is an enemy below you on your line, you can drop from the rope, mid-zip, and pounce suddenly, ferociously, like the wrath of God. Another improvement would be the Eagle Eye. This acts like a map, but an intuitive one, beginning as a small blue sliver within a circle, pointing in the direction of your enemies or target. The sliver expands as you get closer until the blue fills the entire circle when in range. This played a large part of the multiplayer demonstration, in which I took turns as the hunter and the prey. The eye was as helpful in either mode, making the chase more intense for both parties. The demo for Revelations takes place in Constantinople and is more culturally diverse than the previous titles. Where we've been used to the Italian, this society will be peppered with Greek, Turkish, Jewish, Gypsy and Romani. The environment is rich and vibrant, and wide open. There were intense cinematic instances in the single player demo that played in linear action sequences on rails. I was, however, reassured that 95% of the game will be in an open world environment. The historical details in Revelations are a nice touch. The demo was maybe six minutes, and included a chain across the waters leading into Constantinople, a real chain used successfully to protect the city from ships in the 1400's. Greek Fire was introduced as a usable weapon, which is essentially ancient Napalm launching a sticky, caustic substance that holds fire even on water. In a brief teaser we were given some insight into poor Desmond's future. The last time we saw Desmond he was in a sorry state; lost, and broken. The teaser sees him in a desperate fight to fix his psyche and to heal from within the Animus. From within his mind. The host of this particular presentation was purposefully vague, so more on that later. With all of the improvements on an already stable series, I'm very excited to get my hands on the full title in November.